Yara Birkeland will be the world’s first fully electric and autonomous container ship. Operation is planned to start in the latter half of 2018, shipping products from Yara’s Porsgrunn production plant to Brevik and Larvik in Norway. 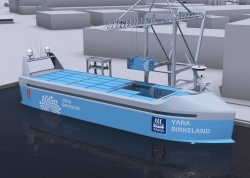 Named after Yara’s founder, Kristian Birkeland, the Yara Birkeland will be the world’s first fully electric container feeder. The new vessel will reduce NOx and CO2 emissions and improve road safety by removing up to 40,000 truck journeys in populated urban areas. Yara Birkeland will initially operate as a manned vessel, moving to remote operation in 2019. It is expected to be capable of performing fully autonomous operations from 2020. 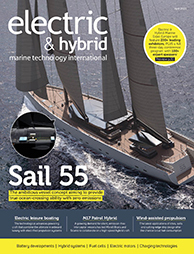 Kongsberg is responsible for development and delivery of all key enabling technologies on Yara Birkeland, including the sensors and integration required for remote and autonomous operations, in addition to the electric drive, battery and propulsion control systems.